Here is another presentation to which I have contributed for the Western Users of SAS Software 2013 conference. I am honored to have served as a co-author with Rebecca Ottesen on this highly original paper. This paper shows how to use your SAS skills to create a resume that is clever, unique, and effective. Your resume should demonstrate strengths and skills, cite meaningful performance metrics, quantify contributions to the organization, and set you apart from the competition, all while being concise and staying to the point. As a SAS user, it is likely that the skill set you would like to showcase involves programming and data analysis, so it seems perfectly natural that you should use these skills to create content for your resume. A well thought out SAS graphic or table might be the perfect selling point to catch the attention of a hiring manager. If you are at the conference, I hope you will attend our presentation Wednesday November 13, 2013 2:30-2:50pm. If not, then you can download the paper here. This is based on a paper written several years ago for SAS Enterprise Guide 4.1. That paper became obsolete almost immediately. So I’ve been wanting to update it for quite some time. This new paper applies to Enterprise Guide 4.2, 4.3, 5.1 and 6.1. Using SAS Enterprise Guide, you can manipulate data and run reports without ever writing a single line of SAS code. So it’s not surprising that many SAS programmers believe that SAS Enterprise Guide is only useful to non-programmers. If you love the SAS language, why would you ever want to use SAS Enterprise Guide? It turns out that there are several reasons why you might want to do just that. SAS Enterprise Guide offers programmers a variety of ways to run code. You can type a program like you do in Display Manager, but you can also use the point-and-click features of SAS Enterprise Guide to generate programs that you can then modify. In addition, SAS Enterprise Guide organizes your work into projects making it easy to find your programs, logs, and results; and the process flow diagrams show at a glance how everything in your project fits together. However, writing programs in SAS Enterprise Guide does require learning a new environment with new windows and a new system for organizing your work. As with any new skill, there is a learning curve. The goal of this paper is to ease that transition by explaining SAS Enterprise Guide from a programmer’s perspective. If you are at the conference, I hope you will attend my presentation Wednesday November 13, 2013 3:30-4:20pm. If not, then you can download the paper here. And if you can’t attend my presentation, you may want to watch this video about coding with SAS Enterprise Guide. I recently learned about an interesting resource for SAS users. 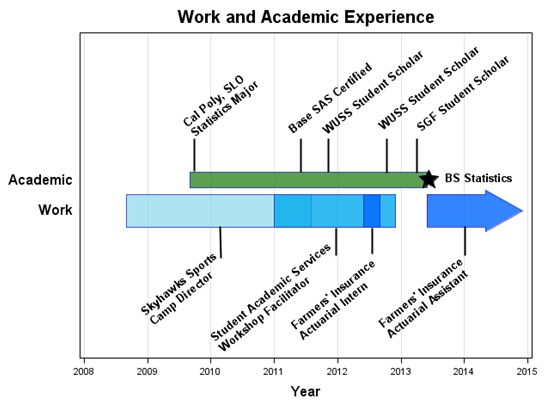 Sunil Gupta—a SAS Press author and consultant—maintains lists of his favorite SAS papers on various SAS-related topics. You can peruse these lists on his page on SAScommunity.org. Still looking for that perfect holiday gift? For a limited time you can save 30% on all books from SAS Publishing. Most of these books are a little big for stocking stuffers, but they fit just fine under a tree. This offer expires Dec. 13, 2010 so don’t delay. Click here for details. I recently got a new computer with a new (to me) operating system—Windows 7. I’m one of those diehards who stayed with Windows XP (and even with Office 2003), refusing to switch to Vista. This is a big change. I feel slightly dazed and disoriented because everything works so differently. So you can imagine how comforting it was when I got SAS Enterprise Guide installed (both EG 4.2 and 4.3) and found that everything looked familiar. More than that, everything worked! I was able to open my data sets and run my projects. Everything was the same as it had been on Windows XP…until I tried to edit a data set. At this point I should confess—what now appears obvious to me—that because Windows 7 is a 64 bit operating system, it makes sense that data sets from Windows XP (a 32 bit system) might need to be converted. At the time it was not obvious for a number of reasons. First of all, I have lots of experience switching from one version of Windows to another, and I have never before had to convert data sets. I figured a .sas7bdat file…was a .sas7bdat file…was a .sas7bdat file. 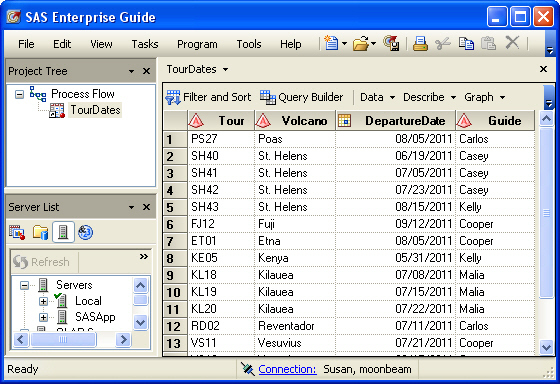 Adding to the confusion is the fact that Enterprise Guide is still a 32 bit application even when running on Windows 7. More important, I had (as I have previously mentioned) already opened my old projects in EG without any problems. I could open my data sets. I could run my projects. Why should editing a data set be a problem when I could do everything else? The problem, ironically, is that CEDA is so good. CEDA (Cross-Environment Data Access) is the feature that allows you to access SAS data sets in formats that are not native to your computer. And it’s so good that it is practically invisible. And when you open a SAS data set in a Data Grid in EG, there is no SAS log telling you that SAS is using CEDA behind the scenes. CEDA allows you to view data sets, and to use data sets, but apparently CEDA cannot be used to edit data sets in EG. Based on the error message, I figured I would need to convert my data sets, but an internet search turned up no confirmation of this. I had some guesses as to how to do it, but I wanted to be sure I knew the officially recommended method. I decided to contact SAS Technical Support. The helpful person at Technical Support asked me a few questions, asked me to run a Data Set Attributes task (that’s PROC CONTENTS for you programmers), and then recommended that I use the Export task to export my data set using the Win_64 format and open it again. When I followed this advice, EG deleted the data set. That’s right the data set was completely gone. Fortunately, restoring that data set was a simple matter. At that point, I decided that maybe trying my own method wasn’t such a bad idea after all. I ran this highly sophisticated program. It worked! When I told the helpful person at Technical Support this, he replied that I could also use PROC MIGRATE. This also works and has the distinct advantage that you can convert an entire library at once. Then I received this suggestion from Chris Hemedinger: Use the Upload task in EG. This method also works but requires two steps since you must define the libref before you open the Upload task. So there are at least three ways to convert your data sets for Windows 7: using a DATA step, PROC MIGRATE, or the Upload task in EG. The first two, of course, will work in Display Manager; all three will work in EG. Everything I said in this post on September 20 is true, but a few clarifications are in order. 1) There is both a 32 bit and 64 bit version of Windows 7. If you are running the 32 bit version, then, of course, you will not need to convert your data sets to the 64 bit format. 2) It has been reported to me that it is possible to install the 32 bit version of SAS Foundation on a computer running the 64 bit version of Windows. If you do that, I am told, then you do not need to convert your data sets to the 64 bit format. I have not been able to test this myself because I am running the 64 bit version of SAS.